You CAN get something for nothing and LAPregnancy has found it for you! B*E*S*T Doula offers a series of free workshops for pregnant women every other Wednesday in the greater Los Angeles area. Workshops are every first and third Wednesday of the month at LA Rocking Chair Store (www.LARockingChair.com) at 304 South La Brea (at Third St). Sit in your choice of a rocker or glider while you meet other pregnant women and prepare for your birth in ultimate comfort. Workshop topics will include: Comfort Techniques & Tips for Partners; Getting Along with Your Newborn; Breastfeeding for Beginners; Using a Birth Ball in Labor; Hypnosis during Childbirth; Writing an Effective Birth Plan; What to Pack for Your Hospital Birth; What You Need to Know about Epidurals; and Questions to Ask When Choosing a Doctor. The doulas at B*E*S*T Doula Service have supported hundreds of women and their partners through pregnancy, childbirth and postpartum since 1996. 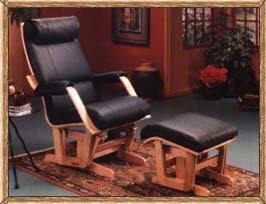 Space is limited, so call (877) I DOULA U today to reserve your rocker or glider now! And check out the artwork on the walls by celebrated pregnancy and family photographer, Heather Hart of A La Mode Photo (www.ALaModePhoto.com). For more information, see B*E*S*T Doula Service at www.BestDoulas.com.